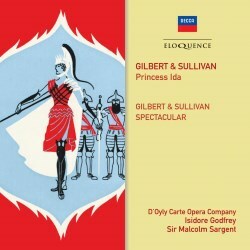 Princess Ida is rather neglected but despite being patchy it also contains some of Sullivan’s most inspired music. Maybe the problem is Gilbert’s approach to the subject of feminism in his libretto. This recording from 1954 is the last mono Decca G & S production in a series that commenced in 1949. The D'Oyly Carte Opera Company would go on to record the whole series of operettas in stereo some years later, again for Decca. Not all of the mono recordings are artistically superseded by the new versions. This 1954 recording is well known to Gilbert and Sullivan aficionados mainly due to the unfortunate miscasting of guest artist soprano Victoria Sladen in the title role. One would have expected her to have brought something distinctive to the role that the Company's own sopranos lacked. Sadly, this couldn’t be further from the truth. Sladen's performance of Ida is really poor and her performance seriously mars the contributions of an otherwise excellent cast. Her singing has a warbling operatic quality that simply doesn’t suit the role or the G & S idiom. It sounds for all the world as if a Wagnerian heroine had turned up to the wrong recording session by mistake. This may rule the recording out of court for some people but that is a shame. The orchestra and chorus are in good shape and Isidore Godfrey is in sparkling form. Peter Pratt is a terrific King Gama and Fisher Morgan is an excellent Hildebrand. The other lady soloists are fine and they put Sladen to shame. Overall, despite the mono recording (which is still rather good and very clear), this is preferable to Sargent’s stodgy and serious remake in stereo some 10 years later. Putting Sladen to one side, this 1954 production is still the one to go for unless mono is unacceptable for some collectors. At bargain price, this is a good way to discover Princess Ida for those who usually stick to the more popular operettas. It’s very enjoyable. By way of a filler, CD 2 includes the 1965 Decca Phase Four recording “A Gilbert and Sullivan Spectacular” but unfortunately there’s nothing spectacular about the recording quality. It has exaggerated left/right separation, some absurd balances and, most destructive of all, extensive passages of serious overload and distortion. How the Decca engineers thought this was acceptable beggars belief. There are some good solo contributions here but Sargent’s direction is dull and excessively slow. The sound is completely ruinous. What a shame. HMS Pinafore: Overture; We sail the ocean blue; My gallant crew, good morning; I am the monarch of the sea; When I was a lad; Finale. The Pirates of Penzance: Hold, monsters; I am the very model of a modern Major-General; With cat-like tread; When the foeman bares his steel. The Mikado: Three little maids; On a tree by a river; The flowers that bloom in the spring; A wandering minstrel; A more humane Mikado. Ruddigore: There grew a little flower.